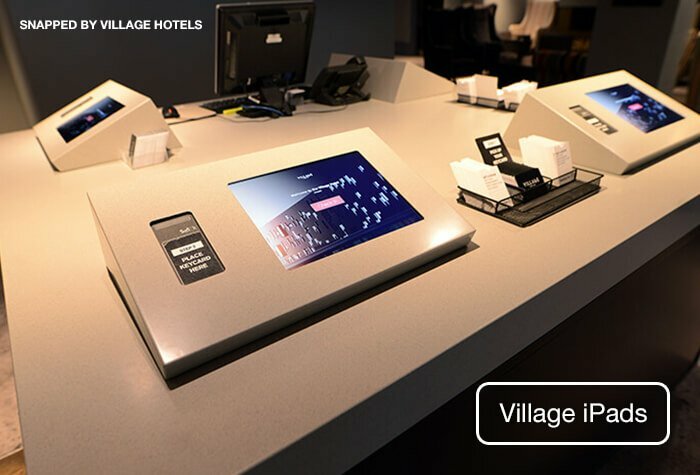 Struggling to choose the perfect hotel at Manchester airport? As the names suggests, the De Vere hotel, Cheadle Village is like a small town. The sports-minded can dive straight into the action at its state-of-the-art leisure club with heated indoor pool, while those looking for a leisurely stay can while away the afternoon in the Victory Pub and Kitchen - which hosts daily deals on drinks and food - or in its dedicated Starbucks. But no-one will want to miss out on an evening in the Victory Chop and Ale House. Its top-notch pub grub and plentiful selection of ales and wines are bound to keep you occupied until it's time to retire to your chic yet homely abode, where free WiFi and Sky TV come as standard. This resort really is a holiday before the holiday. Hotel was ok although booked 2 course evening meal but party in restaurant so had to eat in bar.They wanted to charge us extra but did not pay it.Also booked meet Greet for another guest with P4U which was very bad as they arrived to pick up car at Manchester airport 45 mins late & when car was returned they had stolen chocolate bars left in car which we did not know until later. We had a lovely stay, from check-in to picking up the car we couldn't fault it. The hotel was better than expected. Very friendly staff. I will be booking again for next year when we go away. Our customers rated Cheadle Village on average 8/10 (126 reviews). Read Cheadle Village reviews. 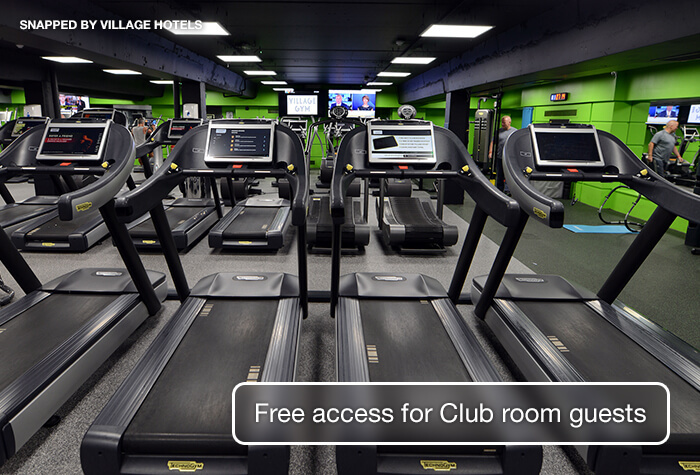 This hotel has a modern look, Starbucks, on-site gym, pool and sauna to help you relax before you travel. A taxi to the airport usually costs around £20, but if booked through the hotel, can be arranged for a special rate of £11. The journey takes around 15 minutes. Parking at the hotel for the duration of your holiday is included in this package. The hotel car park has CCTV and is raised from the main road. 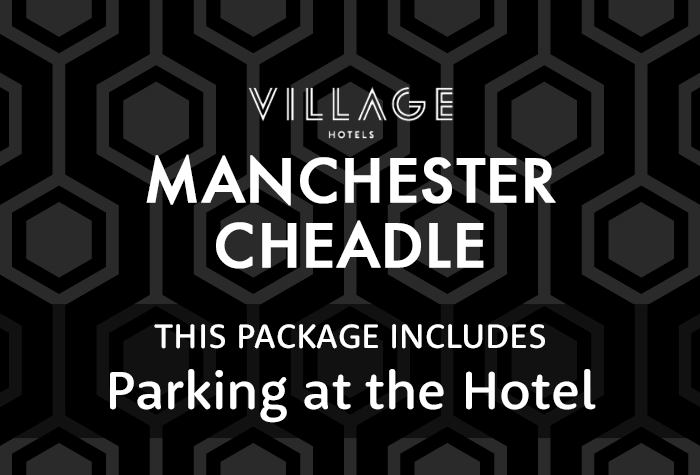 The Village Manchester Cheadle is a 19-minute drive from all terminals in good traffic. Detailed driving instructions and a postcode for satnavs will be on your confirmation email. Rooms are modern and comfortable with large beds and low lighting. Upgrade to a Club room for £20 for a king size bed, Sky TV, Tassimo coffee machine and complimentary access to leisure facilities. 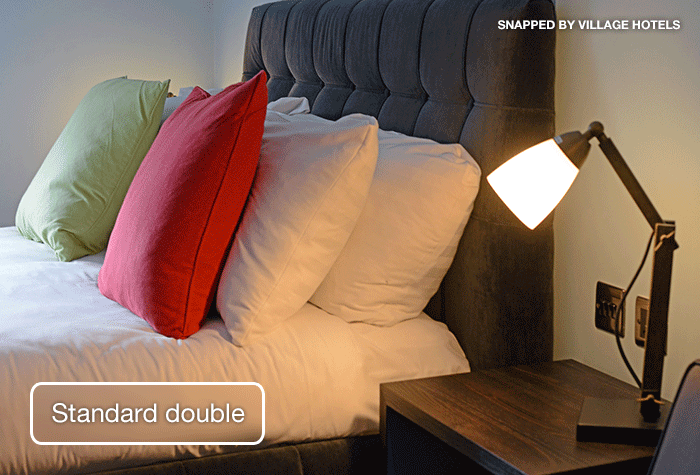 Guests recommend requesting a room away from the leisure facilities for the best nights sleep. High speed wifi is free throughout the hotel. 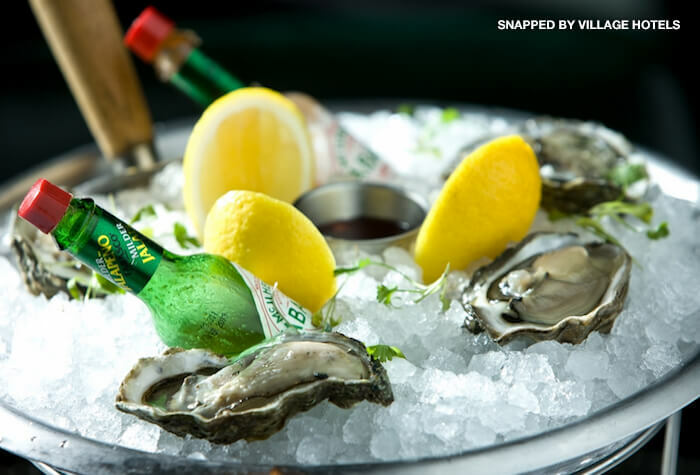 The Verve Grill offers a range of classic food choices, such as burgers, pasta and salads. Main prices average at £14.95pp, with a carvery special on Sundays at £13.95pp for adults. A 2-course dinner add-on through Holiday Extras is £15pp. Guests say that there is plenty of variety and the food is great quality. 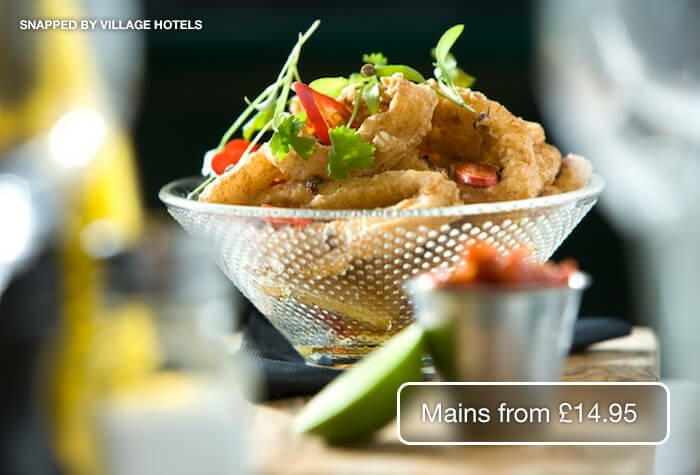 The Village hotel can offer vegetarian, vegan and gluten-free options. They recommend you advise a member of staff before you order to discuss it with them. Open 12noon - 11pm daily. The Village Pub serves soft and hot drinks, spirits, wines, beers, cocktails and bar food. Dishes include sandwiches, salads and light bites, averaging £7.50, with a handful of larger meals like burgers, flatbread pizzas and fish and chips for around £11. If youre staying on a Friday, the bar offers a burger deal, with burgers from £1 with any drink purchase. A small glass of wine starts at £3.95 and a pint of beer averages £3 - £4. A full English and continental buffet is served in the hotel restaurant. Guests say the breakfast is great but get there early to ensure you get a table. Breakfast is usually £10pp, but only £7.50pp with the breakfast add-on through Holiday Extras. 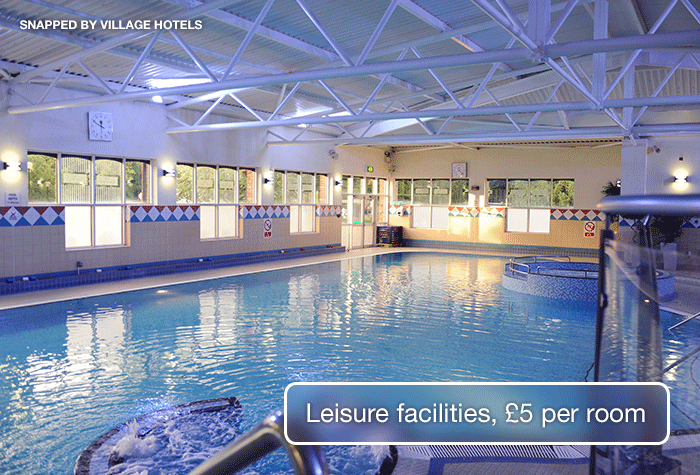 Use of leisure facilities is £5 per room for guests in a regular room, but free for those staying in a Club room. 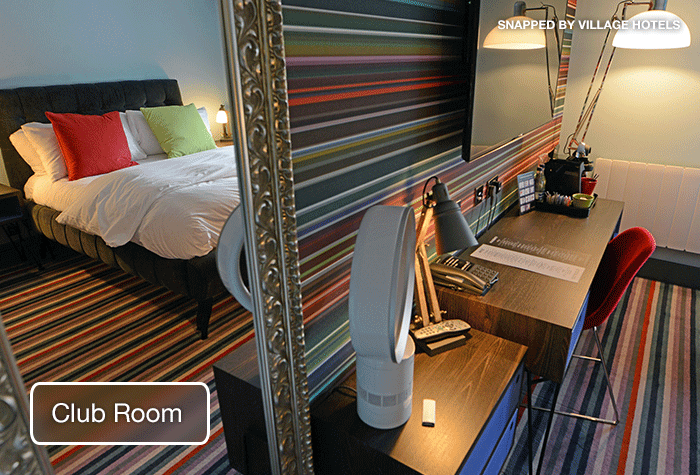 Request a room away from the leisure facilities for a quieter night's sleep. If youre staying on a Friday, check out the burger deal in the bar for a great saving. Head down for breakfast early to guarantee a table. Disabled facilities This hotel is suitable for disabled customers. Small dogs are allowed by arrangement, and disabled customers can access the pool with assistance from staff. 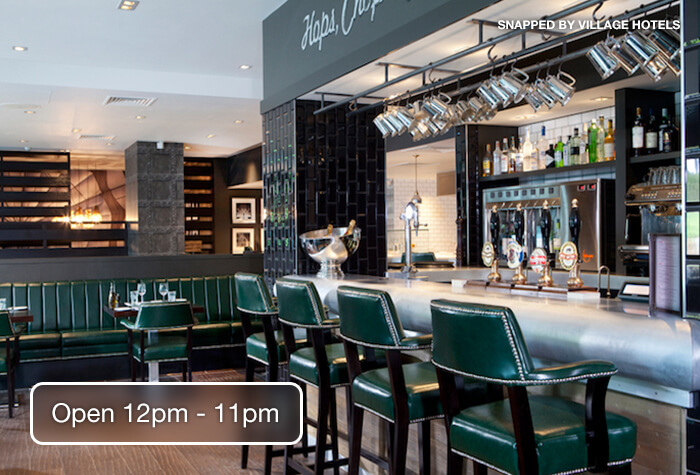 Make your way to the hotel - check-in is from 3pm. Parking for the whole of your holiday is included in the price of this package. Overnight parking is free. The on-site car park has CCTV and is raised from the main road. A taxi booked through the hotel will cost £11. Itll take around 19 minutes to all terminals in good traffic. Call the hotel to book a taxi back for a special price of £15 from the airport and collect your car from the hotel car park. The on-site car park has CCTV, entry and exit barriers and is raised from the main road. Drive to JetParks 1, the barrier will recognise your number plate and issue a token. Park in any available space, keeping your keys and the token with you. Then take the included shuttle bus to the airport. Your confirmation email will include directions and a postcode for satnavs. The secured car park has CCTV, entry and exit barriers, security fencing and is manned 24/7. Take the shuttle bus back to JetParks 1, collect your car from where you parked it and use your token to exit the car park. Drive to the hotels car park and park overnight for free - your confirmation email will include driving directions and a postcode for satnavs. Check in is from 2pm - park your car and head inside to check in. Head to Care Parks car park (directions will be on your confirmation). Check your car in with reception and hand over your car keys. Then, take the shuttle to the terminal. It takes 5 minutes and runs every 20 minutes, 24 hours a day. Check in is from 3pm - park your car and head inside to check in. Check out of the hotel by 11am. Drive to the Meet and Greet office at the terminal, hand over your keys and your car will be parked for you. Walk to the terminal from the car park- it takes 3 minutes. Collect your luggage. Walk back to the car park reception to collect your keys and car.